A book fair is a gathering together in one place of a number of booksellers. Each stall will be run by a different dealer, some of whom may specialize in one field, e.g. first edition fiction or aviation, others may bring a general selection of subjects. Thus the customer gets to view a wide range of books without having to go from bookshop to bookshop. The expertise of the dealers (along with the presentation and the surroundings) is one of the things that differentiate a book fair from a book sale. 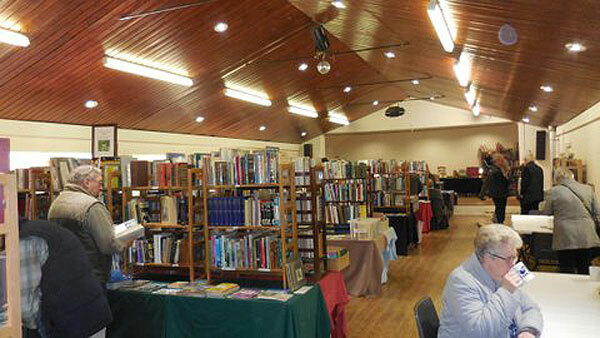 At a fair you can talk to the dealers about the books you are interested in. They may have titles you want in stock at home, they may be able to advise of another dealer who specializes in that field, they may remember your interests and offer relevant books to you at the next fair. They may equally be interested in buying books you no longer require. Also some of the dealers offer a book search service. At Missing Book Fairs you will always find a wide range of books from paperbacks to antiquarian titles. At many fairs you will also find ephemera, prints and postcards. If you have further questions about any aspect of our book fairs, please contact us.